After 3 months in the making, and with multiple hurdles to jump over to even get it launched, I am pretty excited to finally share with you my Kickstarter campaign for a whole new product range! Some of you who may follow me on Instagram have probably seen my various InstaStories sharing all my cooking experiments. Thing is, I hadn’t ever really been a massive ‘cook’ until Ophelia was around 5 months old and was starting on her baby-led weaning journey. I loved to try new things, and was always aiming for a balanced and healthy diet (especially whilst I was pregnant!) but once I started having to think about how I was going to give Ophelia a truly balanced and nutritional diet, as well as a fun and interactive weaning experience, I began to research and cook more. Her weaning experience really made me look at the food I was making for myself and my husband, and the cooking just naturally spread to our meal times. It was purely through this phase that I started to love being in the kitchen, and so, selfishly, wanted to create a collection to help me plan meals, cook and shop for all my ingredients. Not just that, I really wanted it to reflect our Vegetarian/Vegan lifestyle that was kind to the environment too. And so the ‘Eat Kind’ collection was born! 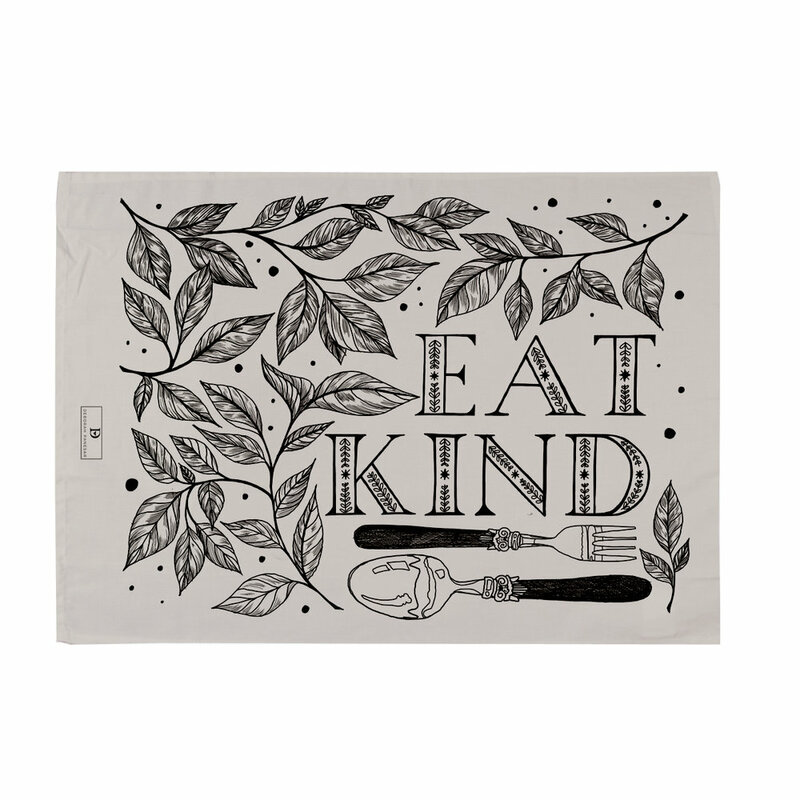 Printed on natural and 100% cotton, these black and white tea towels will feature my botanical illustration surrounding a custom typeface that I have created for the collection, 'Eat Kind'. These are a nod to anyone who believes that the choices we make on our plate can help the world around us. A neutral addition to any kitchen, they will fit perfectly into any decor. I will be having these printed with a British manufacturer, and they will be packaged lovingly with recycled card wrap in a biodegradable sleeve. 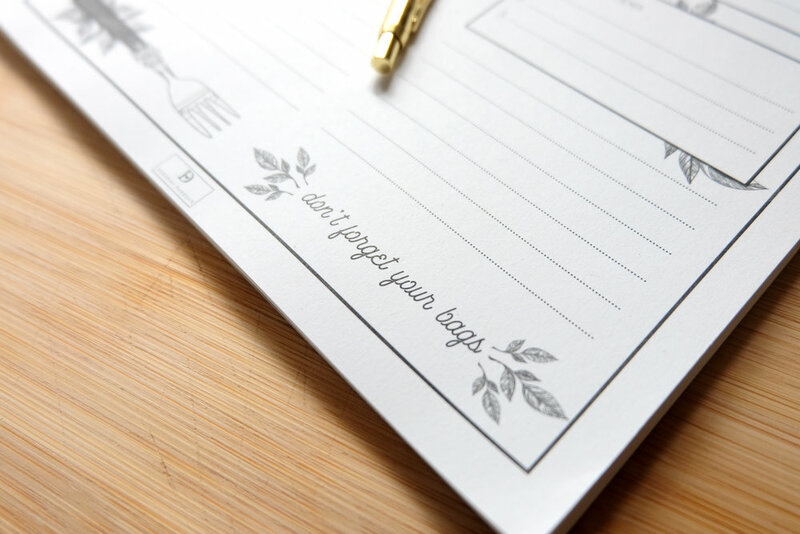 Completely inspired by my weekday shop, this has been created to not only help with remembering the bread and milk, but to help inspire to try cooking something new or batch cook to save for a day when you don't feel like getting the pans out! Printed on 80gsm recycled paper, each pad has 50 sheets and has been secured by glue at the top on a hardback board. 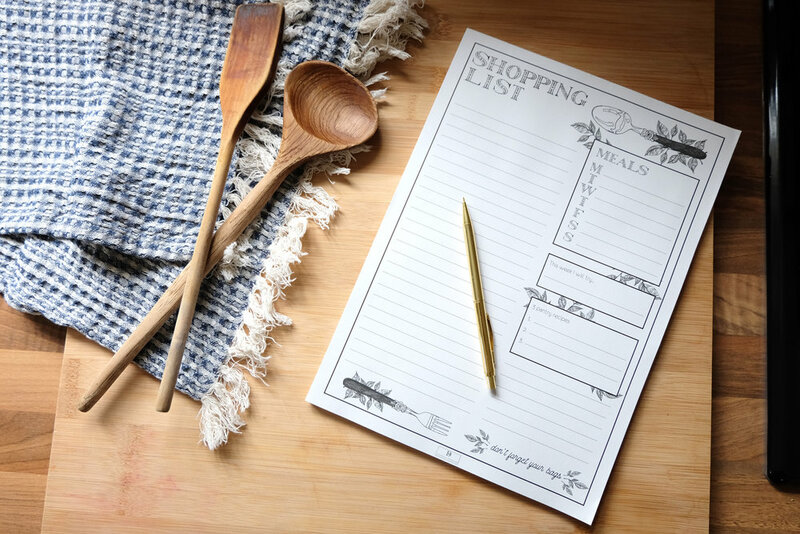 Each sheet features lines for your list, plus sections for planning meals for the week, a 'This week I'll Try' section and '3 pantry recipe's' section. '3 Pantry Recipes' section is for noting down what you need to stock up in the freezer or cupboard; ours is usually peanut butter, scones (for lunch) and ice lollies but it can also be bread, stock, and overnight oats to name a few! At the bottom of the sheet is also a helpful reminder to not forget your bags! It saves you money, and saves on plastic going out into the environment. Once printed, these pads will feature a recycled belly band (paper band) that will wrap around the pad before being sealed in biodegradable cellophane bag. 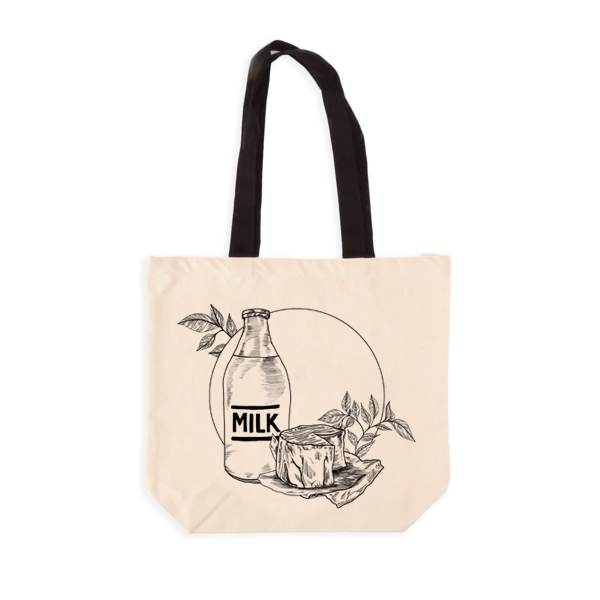 Designed to help get your grocery shopping in order, each of these tote bags has been illustrated to help pack your Bakery, Fruit, Milk & Dairy and Vegetables. These are really handy for making sure that your shopping stays in tact (nothing worse than a crushed punnet of strawberries!) without wondering where you put everything! 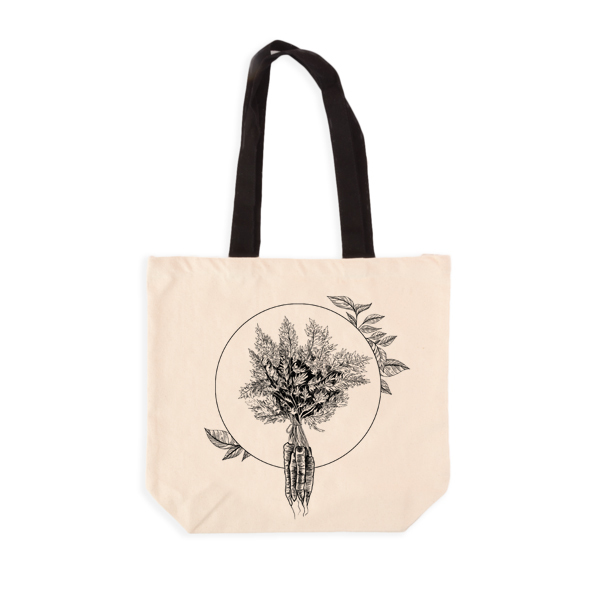 Tote bag dimensions are 27 cm wide x 37 cm high x 12 cm deep. Tote bags are of 407gsm weight making them very strong and sturdy! My custom illustrations will be screenprinted onto the bags, and will feature a recycled swing tag with care instructions, hanging from the handles. Like the tea towels, these bags will be printed with the same UK manufacturer, and will come packaged in a biodegradable cellophane sleeve. So, like many other crowdfunding campaigns I am of course trying to raise the money to make this collection a reality. I’m looking to raise £4,000 by 10th November which will go towards not only the manufacturing of the products, but also printing of all the environmentally friendly packaging. This collection will be my first ever to be made from 100% recycled and biodegradable packaging. It’s my hope that if this is a success, I will transition this huge change into all products across my shop. If you would like to read more about my campaign, as well as to see what kind of rewards I have on offer for anyone who pledges money to the campaign, then you can see it all here. And if you feel compelled to do so, please share this project with your loved ones! It takes a few moments but it truly does help to spread the word around. As always, whatever you do, do it with kindness.